Here’s the deal. I like spicy. I like sweet. Marry the two together and I about flip my lid. That’s what happened when I took a bite of these here chips. 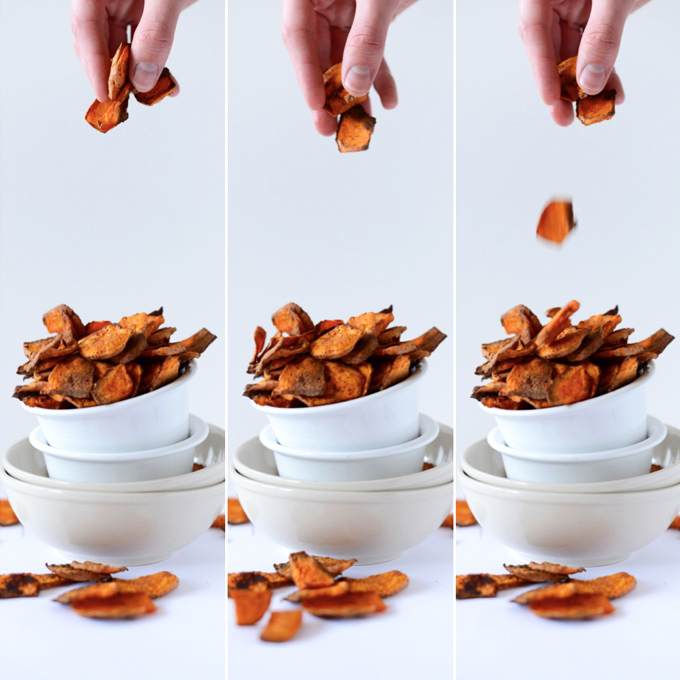 These chips are super simple to throw together. 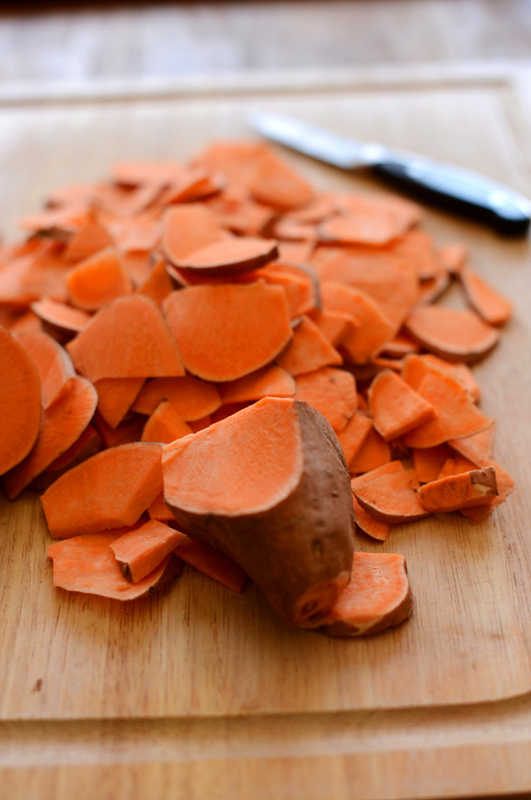 You just chop up your sweet potato, toss it in olive oil, sea salt, chipotle pepper and a bit of brown sugar and bake away. Depending on how crispy you like they should only take about 30 minutes. I like mine a little on the crispier a.k.a. charred side. I know, char causes cancer, so said my college Cancer Perspectives and Controversies professor. But I don’t care none. Mama likes her char. Plus he gave me a C+ in that class, so I don’t give him much authority in my life anyway. Char for life! I tried dipping my chips in almond butter and ohmygosh it was delicious! But they’re honestly great just on their own, like, for a snack. P.S. follow me on instagram if you want to see my lunch, and stuff. You won’t regret it, probably. 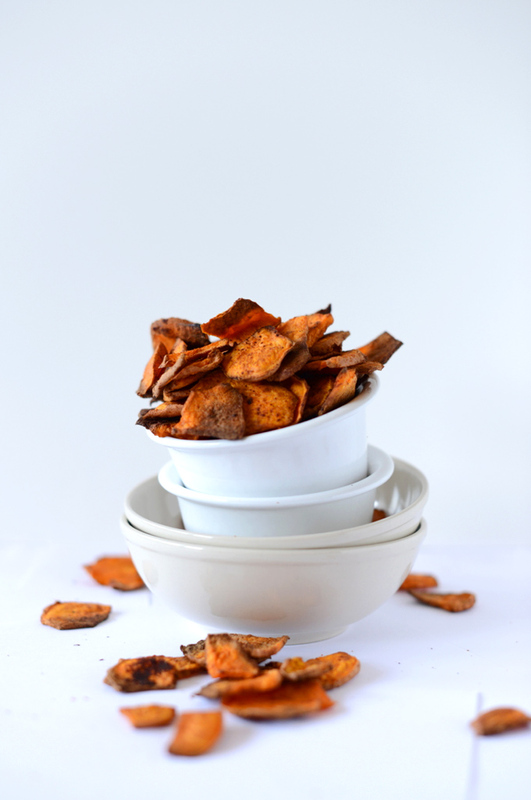 Easy, baked sweet potato chips! A little spicy, a little sweet, and a lot of flavor. 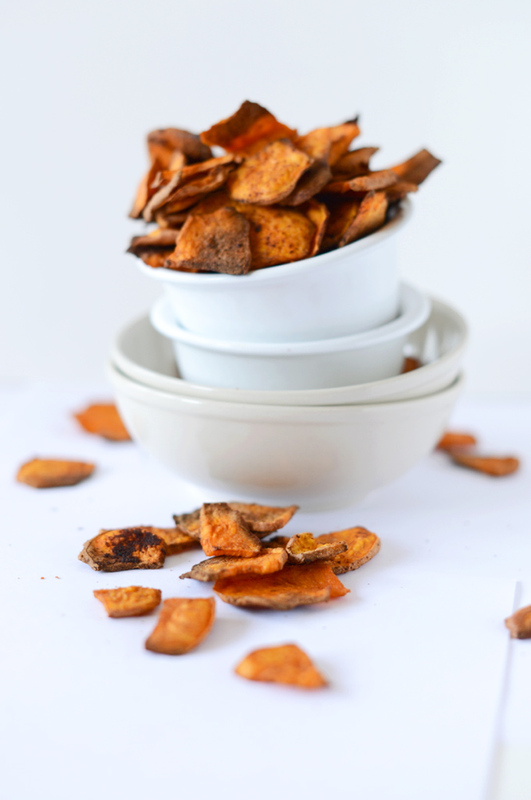 Snack away on these vegan, gluten-free chips! Wash and scrub sweet potatoes. Then, thinly chop with a knife getting them as uniform as possible. The thinner and more consistent they are the more evenly/quickly they’ll cook. 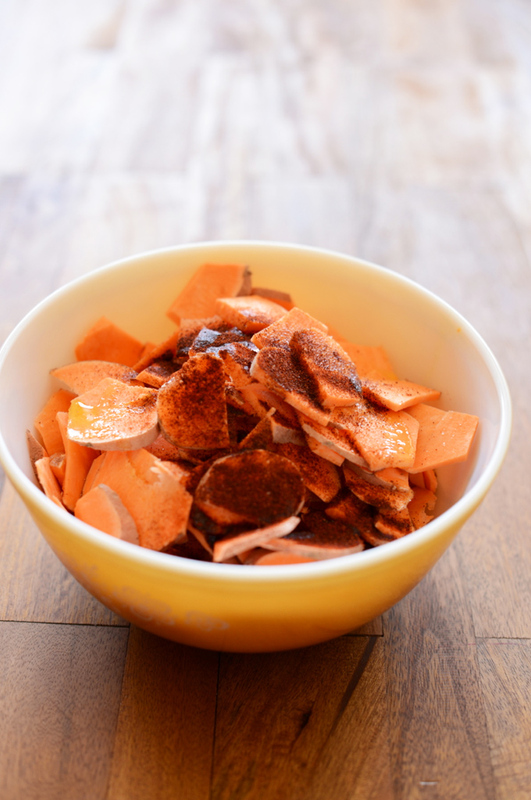 Place potato slices in a large bowl and toss with olive oil. Then add salt, chipotle, and brown sugar and toss again until well coated. Transfer potatoes to two lightly greased baking sheets (or more // use even more sheets if increasing batch size) and arrange in a single layer. Bake for 30-45 minutes, flipping once around the 20-minute mark. You’ll know they’re done when they’re browned and crispy. Be careful not to burn as they turn pretty quickly. Leave out to cool completely, even overnight. And do not bag until then. Otherwise, they can lose their crisp. *Nutritional information provided is based on a rough estimate. Just found this recipe and can’t wait to try! Side note: from what I have read in the past, only char on meat and animal products are carcinogens. Veggies are ok! I see that on the (plain) sweet potato chip recipe it says to serve immediately. I was going to try to make these and bring them camping as an alternative to store bought chips but was wondering if you know if they travel well or if the crispness lasts. Thanks! 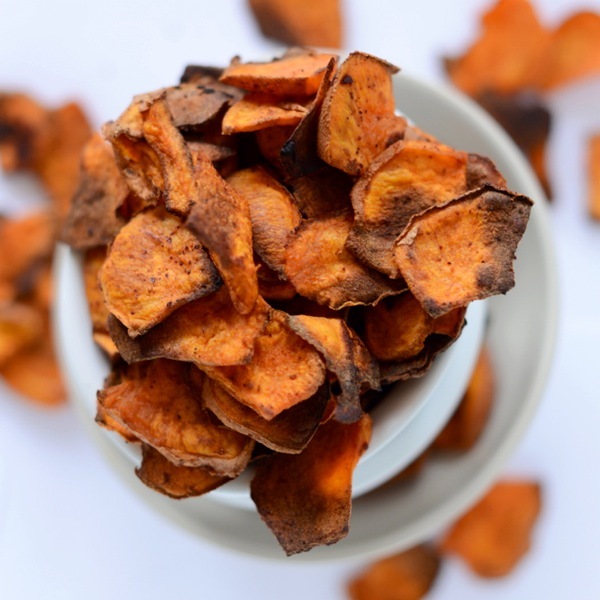 unfortunately, they’ll get soggy : ( If you’re going camping, just buy true sweet potato chips and then dip them in dark chocolate. Those will keep for much longer! Great flavor, but mine didn’t crisp. After rereading the recipe just now, I’m guessing it’s because I didn’t leave them out. Will definitely try again! LOVE this idea! Just tried to make them, though, and they didn’t turn out crispy…just cooked. Help? Bianca, a few my chips did not turn TOTALLY crispy either. But the ones that did I had cut them VERY thin and evenly and they got very golden brown before I removed them from the oven. They almost looked too toasty, but they were just right.Hope that helps! I saw this on Instagram and literally have been waiting for you to post this! I cannot wait to get to make these! I have really fallen in love with your recipes, I love even more that you are from my hometown. these look amazing! I love that they’re baked too! Secretly healthy snacks are the best!! Love these, Dana! I’m so glad to have finally found a sweet potato connection near where I live, so I can spoil myself on the good stuff. Chipotle on sweet potatos is a perfect combination. Ok, um YUM! I totally dig sweet and spicy, and mix it with that smoky chipotle? I am so there. We’ve been making a lot of oven baked fries from Russet potatoes lately — and they keep sticking to the bottom, turning to mush, and then baking into potato-chip tasting things. So, I’ll want to try these intentional chips out soon! Love the kick of the chipotle on these! 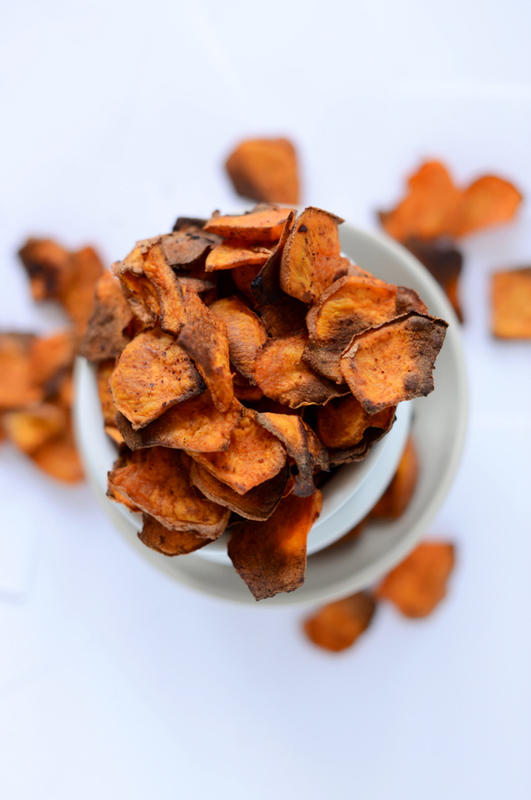 OK, so first you woo me with talk of chipotle sweet potato chips, but then you mention adding dark chocolate and dipping them in almond butter?? I can’t even DEAL with all the thoughts of deliciousness. YUM! These look addicting! I could seriously snack on these all day! I’ve been trying to find ways to bring sweet potatoes into my life as I don’t like them that much, but this looks like an excellent idea and in fact I’m going to try this recipe very soon!!! 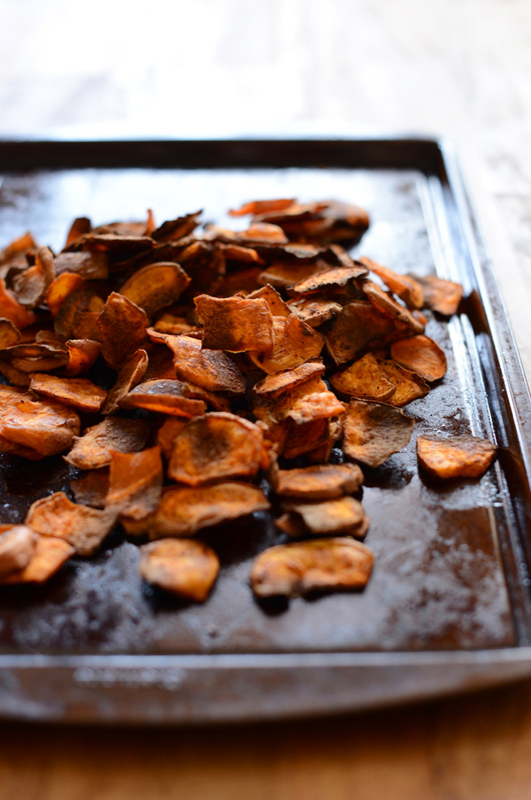 My favorite type of baked french fry is of the spicy sweet potato variety. Though I do find they are hard to get crispy. Guess that means I’ll just haaaaave to try these. Ah, they sound so good!! Thank you for the sweet potato & chocolate idea! so genius! 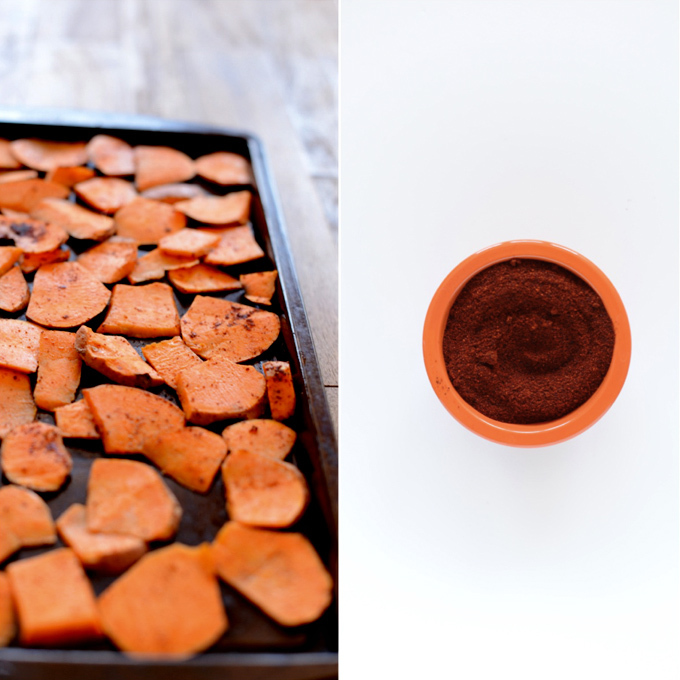 I have a 9 month old baby girl so I don’t have time to make sweet potato chips & dip them in chocolate but i DO have time to dump some raw cacao powder & stevia on top of a baked sweet potato & call it a day ;). YUM! Thank you!!!!!! Oh man, I’m pretty sure I would not be able to stop eating these ever.